Tile roofs : How they look and the way they last. Watch this video for a quick lesson on Tile Roofs. Tile roofs can add beauty, curb appeal and resale value to any home or project. Available in numerous styles and color finishes, tile roofs complement virtually any architectural style. In addition to its aesthetic qualities, tile provides durability, protection from the elements and a long-lasting roofing solution. Tile is often known as red and round however roof tiles come in many colors, profile shapes and sizes. Concrete and clay roof tile manufacturers produce tiles that emulate such styles as authentic Spanish and Mediterranean to New England colonial, historic and more contemporary designs. Through various production techniques, manufacturers have augmented the traditional range of roof tile colors to include natural earth tones, vivid accent colors in blues and purples, and solid white, which helps to reduce summertime cooling bills. For additional variety, customers can select roof tiles in blended colors or install different colored tiles in random or uniform patterns across roof surfaces. Clay roof tile has been used for centuries all around the world. Both clay and its modern partner, concrete roof tile, are extremely durable. With proper building design and installation, tile roofs can last 50 to 100 years, or more. Most roof tile manufacturers provide a minimum 50-year transferable limited product warranty. Unlike other materials, tile does not rot in wet climates and is not susceptible to destruction from pests. Tile can be used in any climate or region and can withstand the severest weather conditions including fire, wind and snow. Most new residential and commercial structures require little or no additional structural support for tile installation. 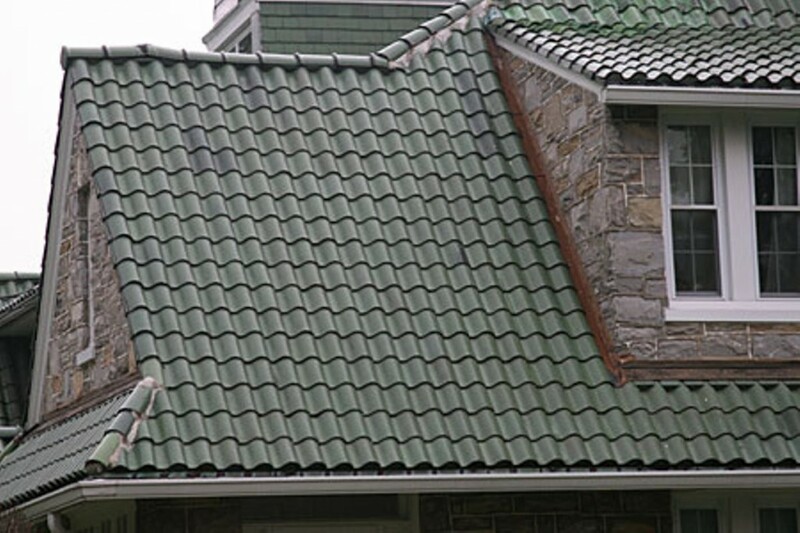 Several tile roof manufacturers offer lightweight tile specifically designed for re-roofing projects. As a general rule, concrete tile roofs cost much less than slate, about two times more than wood shakes, and approximately three times more than heavy-weight asphalt shingles. Clay roof tiles cost slightly more than concrete. Compared to other roofing materials, both concrete and clay tile can outlast the life of the structure, which makes tile a cost-effective choice over the long-term.